The Hankey Center for the History of Women’s Education serves as the central resource on the history of Wilson College through the rich repository of materials and artifacts contained in the C. Elizabeth Boyd ’33 Archives. We provide support for academic programs by making the Center’s staff and resources available to the Wilson community, as well as to scholars, independent researchers and educators in the broader community. Over the course of the 150th celebration, the Hankey Center will be highlighting historical projects including digital collections, oral histories, and more. Check back here updates. This collection holds over 180 digitized historic photographs. 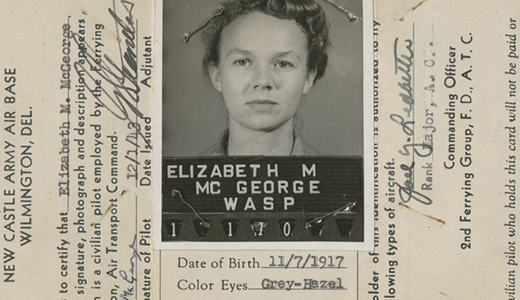 A collection showcasing the history of Women's Airforce Service Pilots during World War II through the lens of Wilson College alumna Elizabeth McGeorge Sullivan. Celebrate the Hankey Center's committed to women's history by viewing over 75 broadsides and brochures from the Suffrage movement. A brief stroll through the history of Wilson College. A collection of photographs of Orchesis performances and rehearsals spanning the first thirty years of the club. This digital exhibit celebrates the history of Wilson's Black Student Union, documenting the organization's impact through photographs, articles, and more. A documentary of Wilson College alumnae from the class of 1964 describing the cultural changes during the 1960s. Stories about bold alumae. Do you know a bold Wilson Woman? Email us their story at hankeycenter@wilson.edu. The Wilson College Billboard Collection - Coming Soon! Provided through generous grant from the Council of Independent Colleges, every issue of the Billboard from 1921 to present will soon be available online. Oral Histories - Coming Soon! Check back for alumni's historical experiences, insights, and perspectives on there time here at Wilson and beyond. Kittochtinny Players Collection - Coming Soon! Explore this collection of photographs, which spans the history of theater at Wilson. Historical account of the College written by the Wilson Community throughout 150 years.